Many people living with fibromyalgia are turning to complementary therapies to help manage their symptoms. According to the Mayo Clinic, acupuncture may help ease the pain of many fibromyalgia symptoms by targeting specific areas of the body, as well as providing general pain relief. Acupuncture is an ancient Chinese healing therapy where thin needles are inserted in strategic points around the body (targeting the major organs), called Qi (or chi) to improve energy flow. It is believed that illness occurs when the Qi becomes blocked. Acupuncture helps to unblock the Qi of the channel so energy can flow more easily. According to Web MD, there are different types of acupuncture. Some use heated needles; others use pressure or a mild electrical current to help the Qi flow. 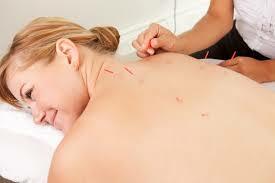 Acupuncture needles are left in place between 20 to 30 minutes. Most people report no pain when the needles enter the skin, but they do experience a tingling sensation. Acupuncture can be used as a standalone therapy for pain relief, but is often recommended as a complement to traditional medications. Changes in pain can be noticed after a few session of therapy.